Last week, we shared that the ability to share audiences from Analytics 360 to Salesforce Marketing Cloud is beginning to roll out. Today, we’re highlighting a number of enhancements to the integration between Analytics 360 and Salesforce Sales Cloud. This integration allows you to import sales pipeline data from Sales Cloud directly into Analytics 360, making it easier to connect your offline and online data. Now, to get a more complete understanding of the customer experience, we’re helping you bring even more Sales Cloud insights to Analytics 360. 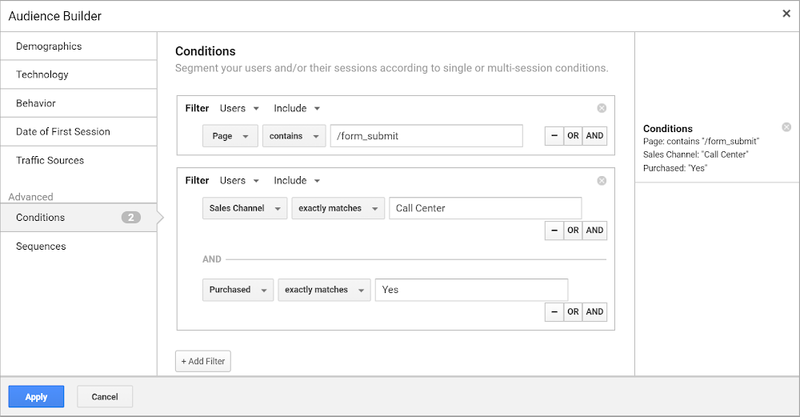 In addition to lead status and conversion data, now you can bring other useful information about your customers from Sales Cloud into Analytics 360—like the state where they are located or their industry type. And once that data is in Analytics 360, you can use it to create audiences, custom dimensions or custom metrics. For instance, let’s say you’re a commercial insurance company and your customers have shared their industry in a lead form on your website. Before, that information may have been difficult for Analytics 360 customers to easily access. Now, with this integration Analytics 360 can pull in a customer industry field from Sales Cloud and you can create a custom dimension using that information directly in Analytics 360. Then, you can build a report in Analytics 360 that combines marketing acquisition metrics with this custom dimension. By doing so you may find that certain marketing campaigns perform better with customers in service-focused industries vs. retail or manufacturing. If your customers purchase products or services offline (on the phone, for example), your teams are likely documenting these transactions in Sales Cloud. With the Analytics 360 and Sales Cloud integration, this transaction information can be easily shared to Analytics 360, and used to better customize your marketing campaigns based on customer purchase history. For example, you may have customers who submit a form on your website to express their interest in placing an order, but who don’t actually complete the purchase until speaking to your sales team on the phone. With Sales Cloud opportunity data available in Analytics 360, you can now create an audience of all customers who have ordered specific products or services from your company in the last three months, even when orders happened offline. And by sharing this audience to Google Ads or Display & Video 360, you can build a marketing campaign that reaches people with similar characteristics who may also be interested in purchasing from you. Build a custom audience in Analytics 360 that you can then share to Google Ads or Display & Video 360. Connecting Analytics 360 and Sales Cloud opens up many opportunities for you and your team. You can set up this integration in three steps. First, set up your Sales Cloud account. Then, make a small change to your website’s lead form to share your Analytics 360 property ID and client IDs with Sales Cloud. Then, in the admin section of your Analytics 360 account, enable data sharing from Sales Cloud to Analytics 360. To learn more about the integration between Analytics 360 and Sales Cloud, check out our new feature brief here.